This Black Friday shopping season I had the pleasure of picking up a heavily discounted Google Pixel 3 for a stunningly cheap $320 in the non-XL, 64GB, Just Black variant. Though I’ve already had a fair bit to say with regards to the Pixel 3 XL and the gargantuan notch it has, I don’t want the sins of the bigger brother to be passed down to the non-XL variant unfairly. Further, as someone coming from a first generation Pixel who eagerly followed all of the leaks and immediate launch coverage of this device, you could say I’m a little bit of a Pixel fanboy to say the least. I feel I should also mention that getting a flagship phone for this low of a price almost no matter the brand would have been a steal, but I will be reviewing it assuming that the user purchased the device for the full MSRP of $800. I’ll be looking through all of the categories that I view as important in this device, then finally offering my conclusion as to who this device is for and if it’s worth your hard earned cash. The Pixel line of smartphones has earned a reputation of having ridiculously good cameras over the last few years, and this year is no exception. Google has managed to, once again, put together some of the best hardware and software in the industry to produce a package that is nearly unbeatable, with a single lens no less. Just in the basic camera mode, the photos have fantastic management of dynamic range and detail with photos being arguably the most true to life in color of any smartphone I’ve seen. Coming with hardware-based optical image stabilization, sudden shakes on bumps still produce clean photos and even full zoom feels like it’s on a gimbal. However, it is worth mentioning that smartphone cameras are getting so good these days that many times the “better” photo may come down to the preference of the viewer instead of one camera being distinctly better than another. As for the specific features that come packed in, Google seems to have pulled out all the stops. Portrait mode with the artificial background blur with the rear camera has produced audible “woah”s from a number of friends I’ve shown it to and is absolutely spot on from what I’ve seen. The wide-angle selfie camera is exactly what it looks like from their marketing material: a much wider field of view on the front facing camera which is also notably better quality than any other front facing camera I’ve seen. Night Sight, a low light photograph mode, must be actual witchcraft because it genuinely blows away any photos I’ve ever seen on any smartphone camera ever before when it comes to photos in low light; I might need to write a whole separate article showing off just how much more detail Night Sight pulls out in low light environments. Photobooth, a feature where you can take a photo with a smile, is kind of gimmicky, so even though it does exactly what it says, I haven’t found it useful except for niche situations. Lens, the ability to point your camera at an object and have Google figure out what it is using AI, is useful in certain situations again, but the technology still needs a few more years to mature before it can really be useful day to day. The slow-motion video is the same from last year, offering ¼ speed at 240 fps and ⅛ speed at 480 fps. Video recording is the only place where the Pixel 3 camera falls behind a little, only offering 4k at 30 fps while the industry standard is quickly becoming 60. Of course, it also comes with all the other usual features like panoramas, photosphere, and AR playground which aren’t anything new. It feels very premium and has a nice weight in the hand from all the glass, but in today’s day and age, that also means it feels fragile. Unlike the previous two generations of the Pixel, the Pixel 3 has dropped the metal back in favor of glass on both sides with a metal border in between. The design on the back is the same two-toned design and fingerprint sensor that has become synonymous with the Pixel brand, but now it’s all one sheet of glass that’s just frosted on the lower portion. This added wireless charging, which is nice, but it also means it has joined the rest of the flagship smartphones that now are twice as likely to shatter from a drop. Glass sandwiches might look and feel great, but in everyday use, they’re probably going to need a case unless you somehow have an ironclad grip on your phone 24/7, detracting from all those great style elements. 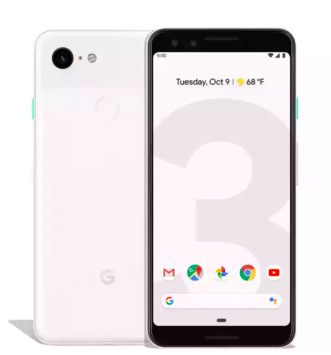 The Pixel 3 also happens to have an issue where the back glass actually gets scuffed up fairly easily against things like keys and coins because it actually grinds off some of the metal from the key like sandpaper and that metal gets stuck in the frosted portion of the glass, making a case even more appealing of an option. Further, the loss of the headphone jack will continue to be mourned, but I think we’ve all begun to accept at this point that it’s probably never coming back. However, the speakers are actually really good, as they are front firing and are arguably some of the loudest if not the loudest speakers available on any smartphone today. It should be noted though that they are a little lacking in base and get a little static-y when the volume is fully maxed out. The built in microphone is also fine, and while some users have reported it sounding particularly bad, I found it to be just on par with most other smartphone microphones I’ve tested. Obviously, it also has both a forehead and a chin to house those speakers, and while I think Google arguably should have made them thinner in this bezel-less era, I think this is a tradeoff I can live with. The battery life is solid, but nothing absolutely astounding; it easily makes it through a day of heavy usage without a charge, but don’t expect to get two days out of it unless you’re being conservative. I was averaging about five to six hours of screen-on time most days with a healthy mix of light gaming, video streaming, Instagram scrolling, music playback, and Google Maps navigation. Packing a 2915 mAh battery, this is about what should be expected, and it will definitely decline over time, but that will be seen in the years to come. Google seems to be putting a fair degree of work into optimizing battery life using AI, and right now it seems to be fairly effective, but it doesn’t seem to have a night and day difference over any other major Android flagship on the market today. Coming in at 1080×2160 with a 2:1 aspect ratio, the screen is up to par with 2018 flagship standards. Honestly, unless you’re coming from a phone with an LCD screen like an older iPhone, you won’t notice a world of difference. As an OLED panel with a 60Hz refresh rate, the blacks are deep and it helps the battery life quite a bit, also offering that always-on display functionality. It gets bright enough for use in nearly any situation you’d run into in everyday life, but it isn’t the brightest phone screen I’ve ever seen. It’s more color accurate than most flagships, but the differences are barely noticeable even if you hold the phones side by side. Some manufacturers offer phones with higher resolution screens, the most notable of which being Samsung, but the lower resolution is helpful for battery life, and most users can’t even discern individual pixels when their face is pressed against the display. A higher refresh rate would also be a great feature that is offered on certain flagship phones like the Razer Phone 2, but it’ll likely be a little while before that makes its way to the mainstream. Essentially, the screen is great, but it doesn’t do anything special, and honestly, that isn’t a bad thing. Using the phone is smooth and seamless for the most part, but it should be broken down into two main categories: UI and Google Assistant. The actual interaction you have with the UI is very similar to any other flagship android phone: smooth and straightforward. You still have your news on the left, your home screen in the center, your notifications in a pulldown from the top, then a swipe up for your app drawer. The only major change was the move to a little pill and back button at the bottom of the screen in the same style as Apple as compared to the traditional home, back, and multitask buttons everyone had come to know and love. This is intuitive for the most part, with a press to go home, a long press to activate the assistant, and a swipe up to bring up previously opened apps. It also brings the added functionality of swiping to the right on the home button to automatically switch to whatever app you were using last. Google still has the squeeze functionality to summon the assistant from the Pixel 2, but I usually find myself just using the “Hey Google” summon prompt instead anyway, as it works from any screen and when the device is sleeping. Being from the Pixel family, it is, of course, running stock Android, meaning it doesn’t come packed with any bloatware, and it overall just feels like a very cohesive, natural user experience. Some users have experienced issues with multitasking given that it only has 4GB of ram, but I personally haven’t found that to be an issue as I usually only keep one or two apps open at a time. As for the Google Assistant, it (no, I refuse to call the Google Assistant “she” just yet) really brings the whole experience together if you’re someone who uses predominantly Google services like myself. From the beginning, summoning the assistant can be done a number of ways: squeezing the sides of the phone, pressing the Google Assistant icon, or saying the “Hey Google” summon phrase. The assistant itself is better than ever, but it still sometimes fails at basic tasks in weird ways. Everything from sending texts to making calls to getting directions to following cooking instructions to reading calendars to taking notes to playing music and more all works seamlessly as usual. A few new features of note are the ability to figure out what song is playing, the ability to have the assistant answer a phone call for you using Call Screening and then have the ensuing conversation transcribed to you, and duplex, the ability to have the assistant call a business and do things like make an appointment for you, coming to certain users in beta. The assistant even makes little things seem so much more logical, like when you’re listening to music it pauses it to tell you that you received a text and who it was from, but if you ignore it a few times in a row, then it replaces it with just a quiet chime. Similarly, if it notices you keep getting notifications that you swipe away, it offers to stop showing them. It makes the user experience feel like you actually kind of have a real human inside your phone helping you throughout the day. However, like I said, sometimes it makes stupid mistakes too; occasionally I’ll ask it to set me reminders or take notes or send emails and it’ll either set the wrong reminder, set it for the wrong time, miss part of the note, send the email to the wrong person, or send the wrong thing, all making the hassle of correcting its mistakes more inconvenient than just doing it myself from the beginning. The number of good experiences I’ve had so far with the assistant vastly outweighs the bad in both occurrence and importance, but these are little things that Google still needs to fix in coming improvements. This is a very average android phone that just happens to have arguably the best camera of any smartphone on the planet and one of the most natural human-device interaction capabilities through the Google Assistant. Obviously, if you need a device running iOS, this isn’t for you, and I hope no one came into this article thinking otherwise, but if you are looking at devices in the Android market, this is definitely not a bad option with the stock Android experience to boot. It’s great for everything from media consumption to content creation, and it can definitely fit the needs of a lot of users. Originally, I would have said no, this phone is not worth the $800 price tag when options like the One Plus 6 are available for a few hundred dollars cheaper. However, in a world of thousand dollar iPhones where most people buy their phones on contract through their mobile carrier, yes, this phone is worth the hefty price tag, and I think any user wouldn’t regret their buying decision going with it.